Matsuri from Play'n GO is a Japanese-themed game. Matsuri is the Japanese word for a festival, usually one sponsored by a temple or shrine. The festival in the slot happens at night, and you can see a lit up mountain town and symbols that show Japanese girls and also tasty-looking food items that you might find at one of these festivals. The game only has music as long as you spin the reels, and then you can enjoy Japanese-style drums, fireworks and cheering crowds in the background. The game has everything expected from a good slot, including shifting wild symbols, free spins and a bonus game. The variance of the game is low to medium, and you will probably get winning combinations regularly. The free spins are probably where you can win most money, as you will have moving wild symbols for better chances of winning combinations. The theoretical return to player is 96.17%, which is average for an online slot. You can also play Matsuri mobile on different iOS or Android devices, as the game is designed in HTML5 and compatible with many mobile devices. 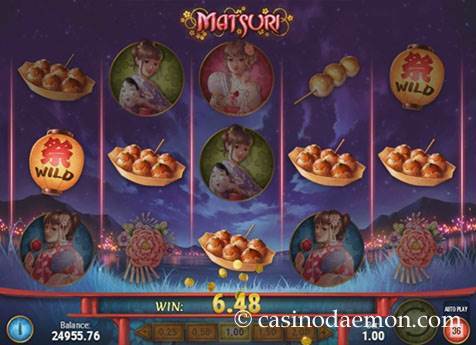 Here you can play Matsuri for free without having to spend a real money. If you feel lucky, and would like to try the game for real money you can play it at one of the online casinos mentioned on this page. The lantern is the wild symbol which replaces other symbols for winning combinations, but not the scatter symbol or the symbol for the bonus game. 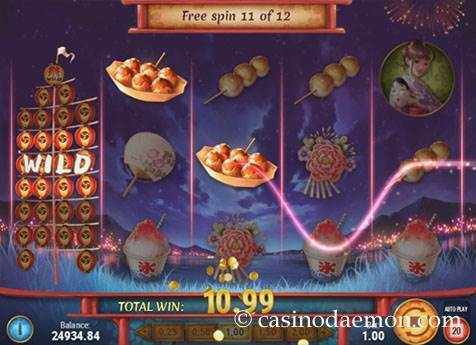 The festival mask with the cat is the scatter symbol, and when you get at least three of them anywhere on the screen you will get 8 free spins. If you get additional masks during the free spins you will get two more spins for each mask. The free spins can be re-triggered up to 20 rounds. The wild symbol also changes during the free spins, and when you get a wild symbol it will expand and cover the entire reel in the shape of a lamp banner, and with each spin it will move one position to the left until it leaves the screen. This means that these shifting wild reels can potentially mean a lot of money, as you can also have more than one on the screen at the same time. The bonus game is triggered when you get three symbols with the goldfish. 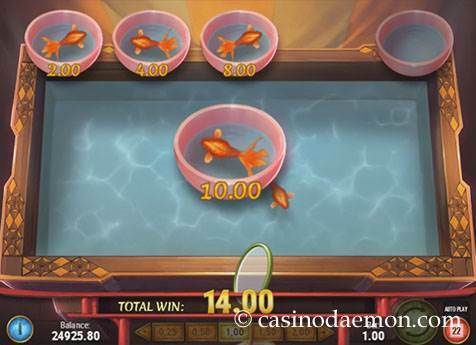 In this bonus game you have to catch the goldfish from the little pond without breaking your paper spoon, and you can win up to 500x your bet. 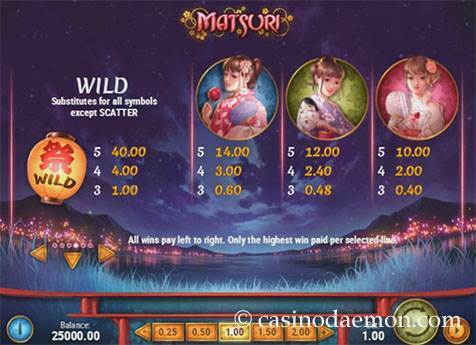 The Matsuri slot has 5 reels with 25 fixed pay-lines. You can select your bet size from the bottom menu, and you can select from values between 0.25 £/$/€ up to 100 £/$/€. The game can also be played with automatic play options.